Queercore is a queer and punk transmedia movement that was instigated in 1980s Toronto via the pages of the underground fanzine ("zine") J.D.s. Authored by G.B. Jones and Bruce LaBruce, J.D.s. declared "civil war" on the punk and gay and lesbian mainstreams, consolidating a subculture of likeminded filmmakers, zinesters, musicans and performers situated in pointed opposition to the homophobia of mainline punk and the lifeless sexual politics and exclusionary tendencies of dominant gay and lesbian society. More than thirty years later, queercore and its troublemaking productions remain under the radar, but still culturally and politically resonant. 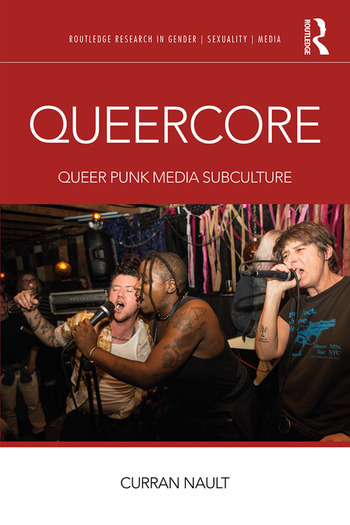 This book brings renewed attention to queercore, exploring the homology between queer theory/practice and punk theory/practice at the heart of queercore mediamaking. Through analysis of key queercore texts, this book also elucidates the tropes central to queercore’s subcultural distinction: unashamed sexual representation, confrontational politics and "shocking" embodiments, including those related to size, ability and gender variance. An exploration of a specific transmedia subculture grounded in archival research, ethnographic interviews, theoretical argumentation and close analysis, ultimately, Queercore proffers a provocative, and tangible, new answer to the long-debated question, "What does it mean to be queer?" Curran Nault is a joint lecturer in Women's and Gender Studies and Asian American Studies at the University of Texas at Austin, USA.